"FRB" redirects here. For other uses, see FRB (disambiguation). The Board of Governors of the Federal Reserve System, commonly known as the Federal Reserve Board, is the main governing body of the Federal Reserve System. It is charged with overseeing the Federal Reserve Banks and with helping implement monetary policy of the United States. Governors are appointed by the President of the United States and confirmed by the Senate for staggered 14-year terms. By law, the appointments must yield a "fair representation of the financial, agricultural, industrial, and commercial interests and geographical divisions of the country". 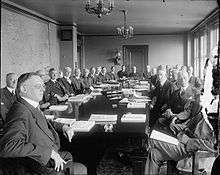 As stipulated in the Banking Act of 1935, the Chairman and Vice Chairman of the Board are two of seven members of the Board of Governors who are appointed by the President from among the sitting Governors. The Board of Governors does not receive funding from Congress, and the terms of the seven members of the Board span multiple presidential and congressional terms. Once a member of the Board of Governors is appointed by the president, he or she functions mostly independently. The Board is required to make an annual report of operations to the Speaker of the U.S. House of Representatives. 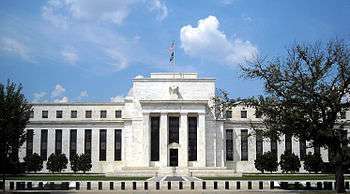 It also supervises and regulates the operations of the Federal Reserve Banks, and the U.S. banking system in general. 1 2 3 Federal Reserve (January 16, 2009). "Board of Governors FAQ". Federal Reserve. Retrieved 2009-01-16. 1 2 3 4 See 12 U.S.C. § 242. ↑ "FRB: Board Members". Federalreserve.gov. 2013-09-03. Retrieved 2014-01-11. 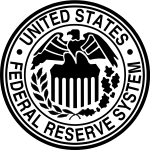 ↑ "Membership of the Board of Governors of the Federal Reserve System, 1914–Present". FederalReserve.gov. Retrieved 2014-06-13. ↑ Schroeder, Robert, , FRB Website, June 16, 2014. Retrieved 2014-06-16.